In honor of National Career Development Month, the Career Center will be raffling off prizes throughout the week, including the ultimate prizes of a brand new portfolio and a GRE Prep Book. To sign up for the free raffle, stop by the Career Center between next Monday and Thursday and enter your name, email address and phone number on the form; and in the process, learn more about how the Career Center can help in your personal and professional development. For more information, please visit the Career Center website. We are located on campus in the Lightsey Building, 2nd Floor, Room 216. In an effort to try and reach out to students and alumni that may not be able to access the Career Center during the day, the Career Center will be starting a “Career Night” workshop series on Thursday nights that will focus on a different topic each week. All workshops will be held in the Career Center (Lightsey Building, Room 216) from 5:30 – 6:30pm. Below is a full list of the Spring 2011 workshops, and if you should have any questions about them, please contact Eric Anderson, Career Center Advisor, at 953-5693 / andersone@cofc.edu. The day is finally here. After four (or five) years, you are now ready to go into the world of professional employment. But where will you find that wonderful new career? 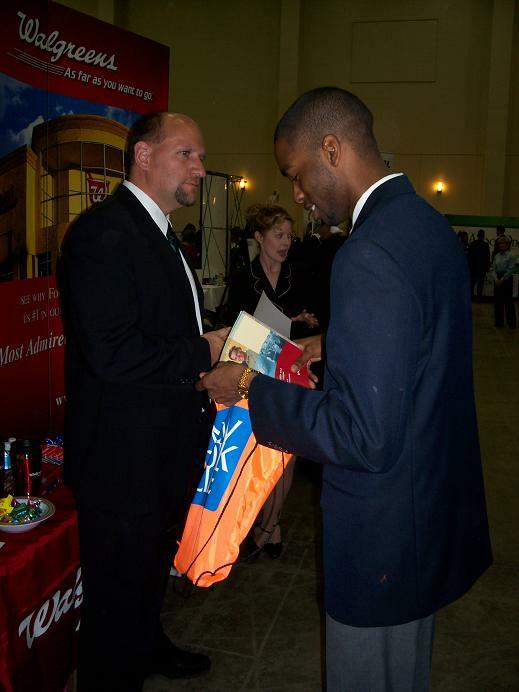 One choice is at the 2009 Spring Career Fair. There will be over 70 different employers lined up to talk to you about possible futures with them. These were just a few tips to get your started. Also, check out the list of companies already slated to come to the career fair and the new preparation video on our homepage. Remember, come to the Spring Career Fair and get started on that wonderful new career that is waiting for you. With the Education Career Fair and the Career & Graduate School Fair approaching, I thought we should discuss making the most out of a career fair. Here are 5 ways you can be a success at the Career Fair. 1. Before the career fair do your research! The Career Center has a list of all participating organizations on our website for your convenience. Research them, find out exactly what they do and what they have to offer you. By doing your research you can develop questions to ask the recruiters and make a positive lasting impression. 2. Take at least 20 copies of your resume with you to the Career Fair. You may only have 5 or 10 organizations in mind, but you need to be prepared in case you see one you had not thought about. Approach as many organizations as possible. 3. Dress to make a great impression. Come dressed to impress the recruiter. If you are actively seeking a job or internship wear a business suit. The recruiter needs to be able to picture you in their work environment. If you are just on a fact finding mission and trying to discover exactly what is out there, wear at least business casual. No jeans, flip-flops, spaghetti straps, or unprofessional wear. Talk to all the employers and smile! 4. Go up to the recruiters. Don’t wait for the recruiters to come up to you. You need to be proactive in the job search, not reactive. Also, gather company literature, applications, and most importantly business cards. 5. Say a simple thank you after the Career Fair. For the organizations that you are really interested in and spent time with at the Career Fair, send the recruiters thank you notes within 48 hours of the fair. This will let the recruiter know that you are really interested and refresh their memory of who you are. For more tips on making the most out of the Career Fair check the Career Fair Video on the Help Guides web page.